The eye doctors at Blink Eyecare and Eyewear have over 40 years of combined experience in providing the most thorough preventative and medical eye care for children and adults. 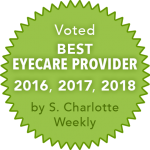 We are locally owned and independently operated in the Ballantyne neighborhood of South Charlotte, NC. We are not a franchise or chain store, and we proudly serve our neighbors from Blakeny, NC and Indian Land. It is our mission to build personal relationships with our patients and make you a partner in the future of your vision. Blink Eye Care personally guarantees the right prescription and the right fit of your contacts and glasses. Our eye doctors will help you find that perfect pair of glasses or contact lenses and keep you updated on the latest lens technologies. We are not satisfied until you are seeing clearly and comfortably. Refreshing isn’t it? 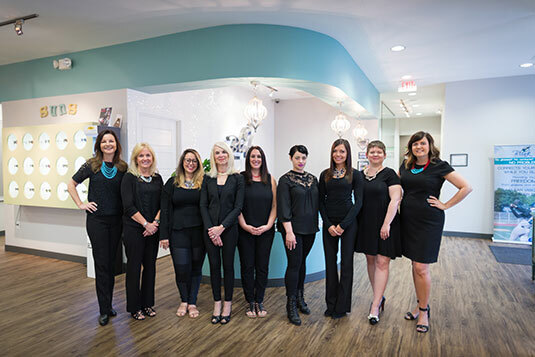 Our receptionists and office staff will try to accommodate your busy schedule by finding appointments that suit your needs. We will help you understand your insurance coverage and if financial arrangements are necessary, we will be glad to help you develop a plan to make your vision care treatment possible. Our knowledgable optical team keeps up with the latest style, fashion trends and innovations in lenses and frames to help you pick the right one for you and your lifestyle. Dr. Charlene Henderson grew up in St. John’s, Newfoundland, Canada. She received her Bachelor of Science degree in Biology from the Memorial University of Newfoundland in 1992. 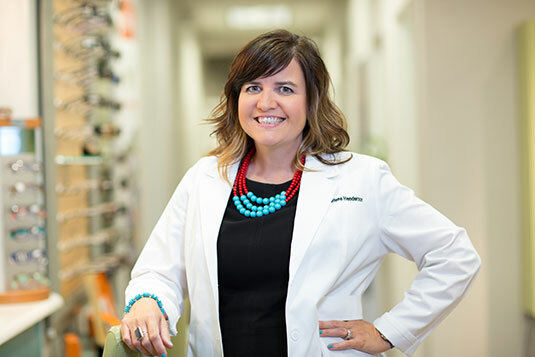 Dr. Henderson earned her Doctor of Optometry degree in 1996 from the Illinois College of Optometry where she received an award for clinical excellence. She then practiced in Waterville, ME before moving to Charlotte in 2000 with her husband Bill. 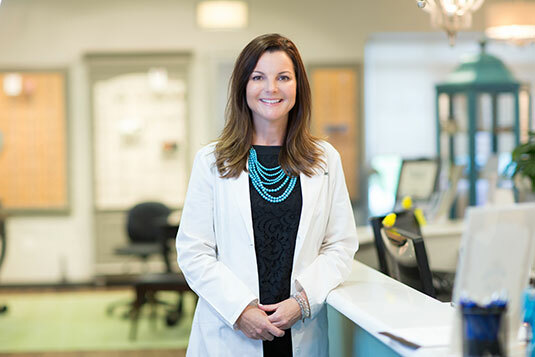 Dr. Henderson has twin boys and enjoys spending time with her family and many creative pursuits. 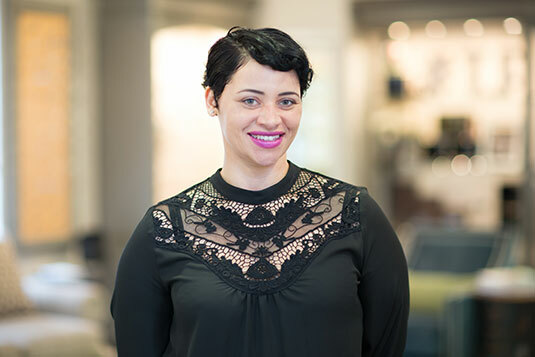 Lisa Kleinhans grew up along the shores of Lake Erie in a suburb of Cleveland, Ohio and is pleased to have settled in Charlotte, NC with her family. She earned a degree in Business from Lorain County Community College in Elyria, Ohio and a Medical Office Administration Certification from the University of North Carolina, Charlotte. Lisa joined the Blink Eyecare family in 2012 and is pursing her Paraoptometric Coding Certification! While specializing in medical and vision insurance and billing, she is also Blink’s HIPAA Compliance Officer. In her free time, Lisa Enjoys being with her family, cooking, gardening, volunteering at local animal shelters, and caring for her Himalayan cat, Ricky. Rachel has been with Blink since April 2016. 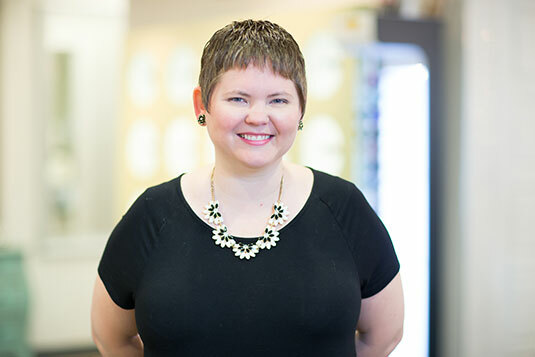 Before making the move to Charlotte, she was living in Pennsylvania where she started her Optical career in 2011, earning her ABO certification along the way. Rachel specializes in lens edging, frame selection, and frame repair. She is also the Ortho-K coordinator and Sports Vision technician. Rachel loves to keep busy and is ready and willing to jump in wherever and whenever necessary! She also loves to create the optical displays in the office. In her spare time, Rachel loves to travel and spend time with her dogs. You can also find her on the weekends rocking out as the lead singer in her band! Melanie has been a technician in the optical field for 13 years and has been with Blink since opening day! 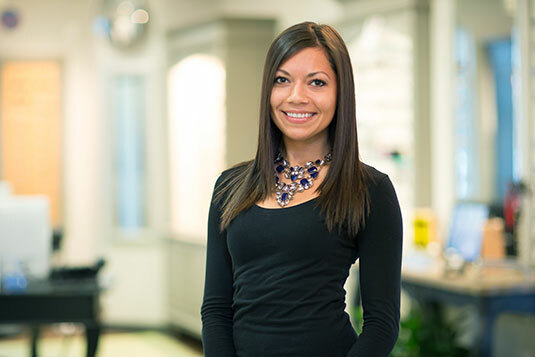 As a loyal employee at Blink Eyecare, Melanie is the go to person for any and everything. She specializes as a technician for contact lenses and orthokeratology lenses. Melanie also has a great deal of knowledge in the optical field and prides herself on being able to back up any of her fellow employees. At home, she spends time with her husband and two kids and loves to crochet, read, and kayak. Stacey has been working in Optical since 1994 and has been with Blink since December of 2014. 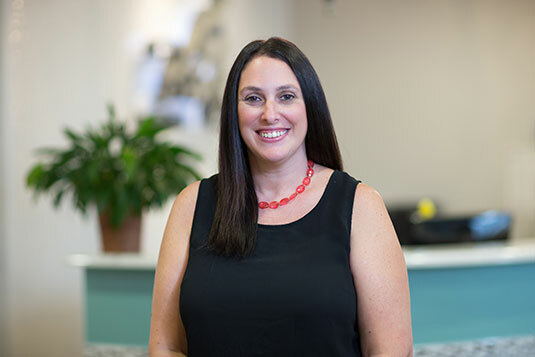 Before starting with Blink, Stacey was working as an Optician on Long Island where she received her New York State Optician’s License, as well as her ABO certification. 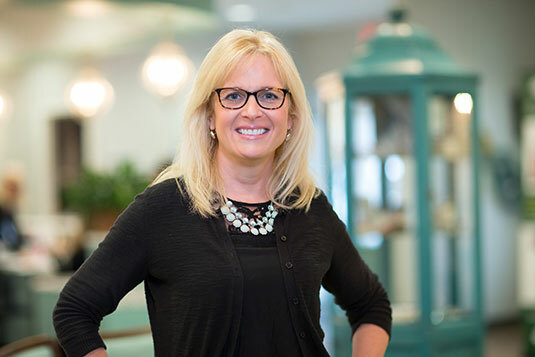 Some of Stacey’s many specialties include: frame selection, progressive lens fittings, and shooting and safety glasses. Her personalized care and customer service is one of a kind and she will be sure to make your optical experience a great one! When Stacey is not at the office, she loves to spend time with her family and friends relaxing at the lake. Amanda has been with Blink since January 2017. Previously she was living in Atlanta where she gained over 8 years of experience as an Optometric Technician. Amanda is a certified customer service specialist and loves working with patients. She prides herself on her hard work and loyalty and is sure to make your experience at Blink a great one. In her spare time, Amanda works hard on her clothing line, designing and sewing everything herself! She also loves to spend time with her family and explore her new home in Charlotte. Rose joined the Blink Eyecare family in September of 2016. 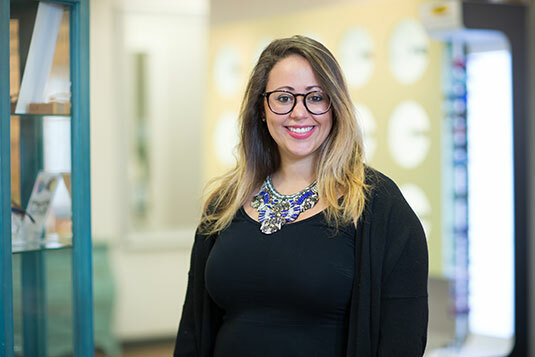 She came to Blink with 10 years of experience as both a optometric technician as well as an optician. She received her bachelors degree in communications from the University of Akron in 2012. Rose specializes as a technician for contact lenses and orthokeratology lenses. She is also working towards receiving her Paraoptemetric certification! In her spare time, Rose loves to work out, spend time with her dog, Bentley, and cheer for her favorite Cleveland sports teams!